What is Structural Integration? 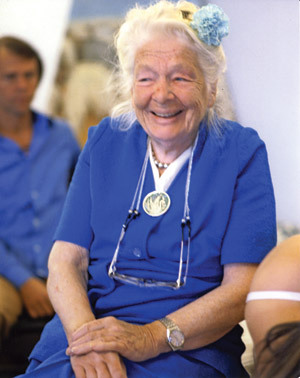 Simply put Structural Integration(SI) is bodywork invented by Dr. Ida P. Rolf. SI has to do with the integration of the human structure with gravity. Any home builder understands that every floor of a house must be square with gravity and with all the other floors; Ida Rolf realized the human body would function better if it was the same way. Unfortunately, do to truama and maybe never learning how most human bodies aren’t even close to lining up most of their main segments (feet, lower leg, upper leg, pelvis, lumbars, thoracics, cervical spine, head and appropriately hanging arms) with each other and with gravity. Don’t believe me? Ask your local contractor to lend you a plumb line and place it beside you so that it is in line with your outside ankle bone (lateral maleolus of the fibula). Now, ask yourself this” does that line go anywhere near the middle of your head(your ear for a decent approximation)? If you are like 98% of the population your ear will be several inches forward of this line. What does this mean in physical terms? That your body, either through mechanical reinforcement (ie laying down more fascia) or through muscular effort is working all the time from keeping you falling on your face. Are you familiar with levers?You can figure out roughly how much force you are having to counteract by multiplying the weight or your head (roughly 13 pounds) by your height by the cosine of the angle that the line of gravity makes with the line between your maleoli and your ear. Trust me it’s a scary amount. What does this mean? It means we are all wasting alot of energy all the time. You can also place that same plumb line in front of yourself say through your belly button and you’ll begin to realize how out of balance you are. Can you see how the left and right parts of your body don’t all fall to the left and right of the gravity line. Now, you might ask yourself well how can Rolf Structural Integration help? Well, this leads to Ida Rolf’s second discovery that the tissue of structure is fascia and that fascia is essentially plastic ie it’s changeable. How is it changeable? Well , by many methods but mainly in Structural Integration by slow sustained pressure. Will any old pressure do? No, not exactly. This leads to Ida’s third discovery that you must open the fascia in the body from the superficial to the deep and she prescribed a 10 session series so that even us monkeys could do it. A Brief description of the ten series. Session 1- release the superficial fascia. Usually around where the bones come out to the surface. And it sometimes is also called lengthen the front. Session 2- release the superficial fascia of the feet and lengthen the back. Session 3- release and fascia of the sides. Create a lateral midline. Session 4- release the fascia of the inner line of the leg and pelvic floor. Session 5- release the deep fascia of the upper body. This includes deep work in the abdomen, chest and neck. Session 6- release the deep fascia of the back. This includes deep work in the gluteal region, the myofascia of the deep rotators of the leg and fascia of the sacrum. Establish the lower pole – the sacrum. Session 7 – release the fascia of the neck, head and face. This includes work in the mouth and nose. Establish the upper pole- the head. Session 8 – organize and release the lower limbs and relate them to the center of the body. Session 9 – release the upper body and relate it to the center of the body. Session 10 – horizontalize the tissue of the body and balance the inside and the outside. Seal the deal. Session 11- time. Once a body is being appropriately informed by gravity ie lining up in gravity. Instead of tearing you down in lifts you up. See Ida Rolf’s seminal work or the work of F.M. Alexander to understand the structural and reflexive nature of our body in response to gravity. What does this mean the more you line up in gravity the more you’ll line up in gravity. Most chronic muscluloskeletal pain is caused by imbalance (and it’s easy to argue that even acute pain caused by a trauma is just a very localized imbalance) and therefore Rolfing is a possible therapy that can help alleviate most chronic issues. Is it painful? You’ll have to come see me to find out. Wear underwear or a swimsuit that you are comfortable being assessed standing in. Usually, before the first session and after the 10th session I take photos of each client. This helps me learn and helps assess the outcome of the series. Eat and drink as per usual except for the fifth session which it is better to not have eaten for a couple of hours if possible. After sessions be prepared to take it easy. I often feel like going about my business (including exercising and playing sports) after sessions but other times that doesn’t feel like a good idea. Listen to what your body is telling you after each session; do i need a nap? or a hot epsom salt bath? or is it OK to go about business as usual and see what my body is telling me. If you are pregnant inform me immediately. It is generally not recommended to do the deep sessions(numbers 4-10) while pregnant. However, general work to ease the back and hips during pregnancy is highly recommended but not the series. A few months after birth is a great time to start the series. Generally, for cancers that spread through the body via the blood and lymph Rolfing is contraindicated. Rolfing enhances the bodies fluid flow and hence can increase the spread of these types of cancer. As well, advanced bone cancers are also contraindicated.